The piano that sings has sustain. To determine whether a piano has sustain, strike a middle C and hold it down. Listen as the sound decays. You will hear a complex sound that includes middle C and a whole series of higher pitches. Middle C, the struck pitch, is the fundamental pitch. The higher pitches are called partials. The fundamental pitch carries the tone’s warmth and power; the partials color the tone. When a piano lacks sustain, after a very short time the fundamental pitch goes silent. For the rest of the decay pitches one to four octaves above it create the illusion that you are still hearing the fundamental pitch, middle C. When the fundamental is an illusion, it is experienced as a memory. Though the ear can still determine what the pitch was supposed to be, the present and immediate physical enjoyment of the pitch as sound has been removed from the experience. Poor sustain, the absence of the fundamental pitch, creates a vague frustration which many pianists find difficult to articulate. 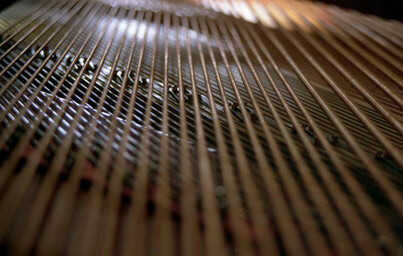 In a piano with sustain, the fundamental pitch is physically present and sings throughout the entire decay. The simple fact that you can hear the fundamental completely transforms the musical experience. Sustained fundamental pitch creates singing tone. It inspires the music and resonates deeply within us.